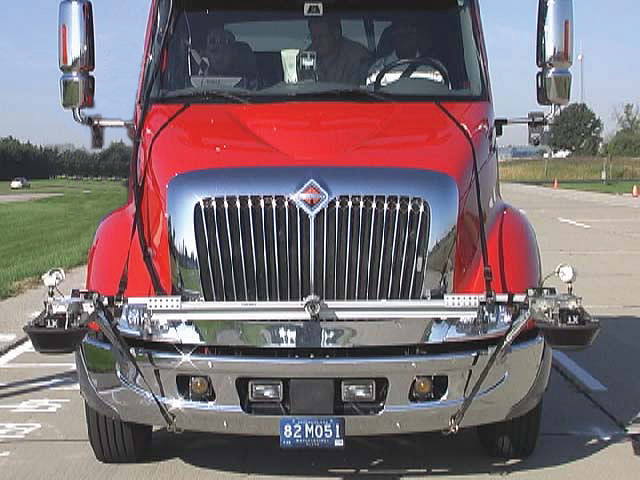 Truck cab instrumented for tests of collision warning systems. Engineers at the National Institute of Standards and Technology (NIST) in the U.S.A. have developed and tested a laser-based ranging system to assess the performance of automobile collision warning systems. Researchers in industry and at the U.S. Department of Transportation (DOT) will be able to use the NIST technology to accelerate the development and commercialization of safety systems that alert drivers to multiple, and sometimes virtually simultaneous potential crash hazards -- both from forward or side collisions as well as from running off the road. DOT believes that such warning systems could reduce substantially the number and severity of injuries to motorists and save lives. Preliminary tests of prototype collision detection systems with the NIST technology have revealed both potential benefits of the systems and areas that need improvement. According to DOT, of the 3.6 million rear-end, road departure and lane change crashes that occur each year in the United States, 27,500 result in one or more fatalities -- about three-quarters of America’s yearly auto-related deaths. DOT estimates that widespread deployment of advanced integrated driver assistance systems may reduce such collisions by 48 percent. The department has formed a partnership with the automobile industry called the Integrated Vehicle Based Safety Systems (IVBSS) initiative to hasten deployment of advanced warning systems in the <?xml:namespace prefix = st1 ns = "urn:schemas-microsoft-com:office:smarttags" />U.S. vehicle fleet. NIST used the IMS to evaluate the performance of two systems built by IVBSS industry partners for a light vehicle and a heavy truck. Researchers collected data in representative crash-imminent driving scenarios in which a crash warning should be issued as well as scenarios that might cause a system to issue a false alarm. Both systems passed most of the more than 30 tests conducted last fall in East Liberty, Ohio and Dundee, Mich. However, the IMS revealed some warning system problems in detecting whether forward vehicles were in-lane or out-of-lane on curves or during lane changes. The IMS also measured significant warning delays that resulted in test failures. Such problems are common in automotive crash warning systems that must operate in real-time, at highway speeds, and use multiple low-cost sensors to measure complex three-dimensional scenes.